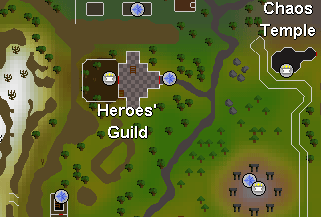 The Heroes' Guild, located north of Taverley and south of Burthorpe, is one of the most renowned guilds in the land of RuneScape. Only after completing the Heroes' Quest, thus proving yourself worthy of the "Hero" title, will you be allowed to enter this guild and have access to its exclusive features. Inside you will find a shop to buy Dragon Battleaxes and Dragon Maces, as well as the Fountain of Heroes, which will charge Amulets of Glory for you. Having already completed the Hero's Quest is a requirement for entering this Guild, which is watched over by Achietties, a Hero wandering around outside. The guild itself is located north of the Druid town of Taverley, and south of Burthorpe. When you first go inside, you'll see various decorations on the walls, as well as 2 statues of Arrav and Camorra in the center of the room. The Fountain of Heroes originally was found where the statues now stand. The yard located in the back of the Guild has the two biggest Evergreens in RuneScape. You will also notice a stairway to the upstairs and a ladder to the underground in the main room. Upstairs can be found Helemos, a retired Hero who owns a shop of Dragon items called the "Happy Heroes Hemporium." There is also an altar to Saradomin against the wall to the west, as well as three ladders going to the next floor. The two ladders on the sides lead to towers, but the one by the altar leads to an outdoor deck. The Heroes' Guild basement is a long, twisting cavern. There is a mine with two Mithril, two Adamantite and two Rune Rocks, as well as 10 Coal Rocks to mine from! You'll also encounter several level 27 bats, but if you're strong enough to be in the Heroes guild they won't bother you. A level 111 Blue Dragon can also be found in a cage, if you wish to fight it. It has been slain many times for it's experience, hides and other treasure by fighting styles of all types. Finally, towards the end of the twisting passage is the Fountain of Heroes, which is used to enchant Dragonstone Amulets to its full 4 charges. Just use the amulet with the fountain to dip it in. You'll be able to teleport to Al Kharid, Draynor Village, Edgeville, and Karamja when you rub it. A charged amulet will also give bonuses to your stats, and a higher chance of finding a gem while mining. It will add 10 to all Attack stats, 3 to Defence stats, 6 to Strength and 3 to Prayer.